The Earl of March has announced many of the key attractions due to appear at this year’s Festival of Speed (3-5 July), as well as the Goodwood Revival (18–20 September). Many of the top competition cars, motorcycles and supercars due to be at the Festival in July and the Revival in September were gathered in the Park at Goodwood House to celebrate the official unveiling of the plans for the 2009 Goodwood motor sport season. On hand to assist the Earl of March outline his plans for 2009 were ex-Formula One legends Damon Hill, Jacky Ickx and Jochen Mass. Rally giants Rauno Aaltonen and Russell Brookes were also in attendance, as were Le Mans drivers Richard Attwood and Anthony Reid, plus motorcycle heroes Guy Martin, Michael Dunlop and Paul Smart. An exciting stop press announcement by Lord March was the confirmation that Goodwood will be helping to make current Formula One World Champion Lewis Hamilton’s dream come true. He will demonstrate the 1988 McLaren-Honda MP4/4 turbo, as driven by his hero Ayrton Senna, up the famous 1.16-mile Festival of Speed hillclimb. Lewis Hamilton’s charity, the Lewis Hamilton Foundation (LHF) will be the official charity of this year’s Festival. The LHF is a non-profit organisation focused on improving the lives and opportunities of children and young people who have a dream and are living in ill health or poverty around the world. The theme of the 2009 Goodwood Festival of Speed is ‘True Grit­ – Epic Feats of Endurance.’ The theme celebrates the drive and determination of motor racing’s heroes, who overcame huge physical, mental and mechanical barriers in their quest for glory. From Jackie Stewart’s enduring victory at the 1968 German Grand Prix, despite his broken wrist, to Mick Doohan’s courageous return to motorcycle racing in 1992, without full use of his right leg, there are countless amazing tales of performances far beyond what was thought possible for any human being. In attendance to help represent this theme were a number of cars once driven in anger by many of motor racing’s greatest heroes, including the victorious 1959 Le Mans 24 Hours-winning Aston Martin DBR1 and Richard Attwood’s famous Porsche 917K, one of many that will be at the Festival in July. Also on display as a taster for a paddock full of supercars and Britain’s main ‘moving motor show’ at the July Festival of Speed were the new Nissan 370Z, BMW Z4 and closed-canopy Caparo T1, all making their UK debuts. A pair of historic racers from the Audi’s successful competition career (Auto Union Type D ‘Silver Arrows’ racer and ex-works Audi Quattro Sport S1) were also on hand to celebrate the marque’s centenary, which will be honoured as the main featured marque at the 2009 Festival with a jaw-dropping sculpture dominating the scenery outside Goodwood House. Expect to see a record number of Silver Arrow racers gathered together at the Festival this summer. An original 1959 Mini was present at Goodwood House too to mark this iconic British car’s 50th anniversary, which Goodwood will be celebrating in style at both the Festival of Speed and Revival. A dozen mini skirt clad models posed with the Mini, and then in the best 1960s tradition, squeezed inside the car to see how many mini skirts you can cram into a Mini. The answer is 12, incidentally! 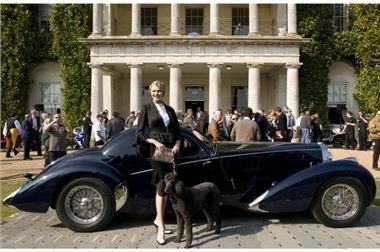 Top model Jodie Kidd also posed with a beautiful Gangloff-bodied 1937 Type 57C and a French poodle to help illustrate Goodwood’s planned celebrations for the important centenary of Bugatti, which will form a class of the Cartier ‘Style et Luxe’ concours d’elegance. The actual Festival of Speed and Goodwood Revival events will feature many more attractions as well, details of which will be released in the near future.